Help for aggressive roosters that attack people, fight with others, or are rough when breeding hens--with photos & pictures. For more information to help prevent fighting, also see "How to Keep Peace in Your Coop". Why shorten a rooster's spurs? 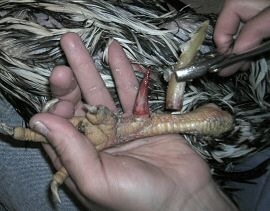 Being aggressive & attacking people: Trimming or removing a rooster's spurs can help make it less dangerous and cocky. Trimming toenails & filing tip of beak can help, too. Roosters fighting too much & aggression with each other: When roosters are persistently over-aggressive & fighting, trimming or blunting one or more roo's spurs can help reduce injuries. Hurting hens & giving them bare backs: If a rooster is causing hens to get bald backs from breeding, trimming spurs might help alleviate injury & damage to hens. Trimming toenails & filing tip of beak help, too. "Chicken saddles" for the hens also help. Less hurt when introducing new roosters: Rooster behavior will be aggressive when meeting new roosters. Comfort / difficulty walking: Some roosters' spurs grow so long and at angles that make it difficult for a rooster to walk comfortably. The rooster will be less able to protect the flock & himself from dogs, hawks, & other predators. The rooster will be less able to protect himself from other chickens. The removal procedure causes some moderate (though short) pain, & the remaining spur center will be be more sensitive & vulnerable to injury for a few weeks afterward. The rooster will have a harder time running off cats or other birds that try to pester the chickens. There is a sensitive "quick" center (similar to the "quick" in dogs' toenails) in the base section of a spur. It extends through 1/3 to 2/3 of the length of the spur. Inside light-colored spurs, the "quick" can be seen vaguely as a darker, reddish area. The spur's base section where it connects to the rooster's leg IS also sensitive, and it is NOT designed to be flexible. When working on a spur, BE CAREFUL TO NOT BEND IT too much toward or away from the leg--or you will create pain and possibly some damage. The layers in the outer shell of the entire length of the spur are NOT sensitive. How to remove or trim the spur with minimal pain and without seriously hurting the rooster. Removing a spur's outer shell results in the spur being shorter and smaller than if the spur's end is simply cut or trimmed. The outer shell can be twisted off since there is minimal skin connection between the spur's shell and a rooster's leg. The "Hot Potato" method helps minimize pain and bleeding, and possibly reduces healing time. Almost no bleeding occurs during during shell removal, though the "quick" / center core will bleed some if bumped within several days after removal. A new protective outer spur shell / "casing" will begin hardening over the "quick" within a couple weeks, but will take another few weeks to reach normal thickness. How the spur's "quick" looks after the spur sheath/shell is removed. Original outer spur shell is held in pliers at right. When you pick up a chicken, put one hand on each side of it, and press its wings against its body (to prevent flapping) while you lift it up. Have your thumbs pointed upwards and fingers pointed down, supporting the bird's lower body. Holding a bird this way also helps keep the skin on the chicken's breastbone from being pulled tight (which can sometimes be painful, especially for heavier chickens). When you are holding chickens, you should leave their legs hanging down free. When you take a chicken out of a cage, face it toward you before picking it up and removing it through the cage door. After picking up a bird, you can usually hold it against your body with one arm, with its head pointed toward the elbow of that arm. (Until it settles down, you may need to use your other hand to help keep its wing against its body.) Turn it so its head points toward your elbow. Few chickens will bite when held this way. Many chickens will nestle their head into your elbow because it is comforting and similar to being snuggled under a hen's wing. It may reduce stress sometimes if you wrap a folded-in-half bath towel snugly around a chicken's body, and allow it to tuck its head into the towel. Try to prevent the quills of large feathers too much. These have some sensitivity and can be damaged. The quills of large feathers (such as on wings and tail) have some sensitivity. Try to prevent them from getting twisted too much or broken. Prepare a clean area with soft pine shavings a few inches deep that the rooster can live in a few days after spurs are removed. If rooster normally lives with other roosters, it is best if he be protected from them at least a week after treatment (or a few days if he is the head rooster). He should be kept in a cage or pen inside the same coop. That way the roosters keep contact with each other and will be milder in re-establishing the pecking order when he's turned back loose. The spurs will be extra sensitive to cold after removal. If removing spurs during cold weather, provide a heat lamp if possible. Soften the connecting skin at the base of the spurs. Fill a pan or deep bowl with warm water. 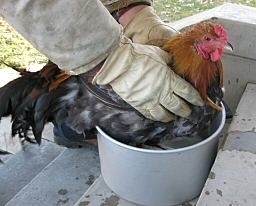 Hold the rooster with your hands with his legs and spurs in the water for a couple minutes. This will soften the skin and loosen any dirt on his legs. Use an old toothbrush and mild soap to do a little basic cleaning of the rooster's legs and spurs. Dip his legs back into the water to rinse off. 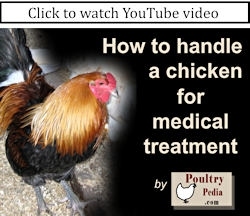 Another alternative is to put an ointment such as Vaseline or Neosporin (the kind WITHOUT pain relief ingredients--Those can be harmful to chickens) on the skin around the base of the spur a few hours before removing it. Note: Photo was taken on a chilly day. Gloves are not normally necessary. Meanwhile, microwave a raw potato 5-8 minutes until it is cooked. Let cool off a couple minutes so it is very warm but not hot enough to burn skin. Sit with your thighs parallel to the ground and your lap flat. Press your hands firmly against the rooster's wings while you turn him over. Lay the rooster on his back in your lap, or partly on his side. His head can be slightly lower than the top of your knees. Hold him there by gently squeezing him with your thighs. 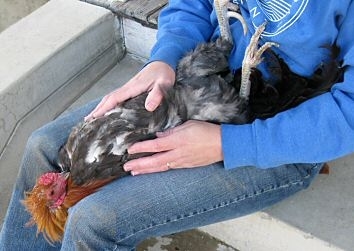 Chickens generally lay calmly in this position after a minute or two. Alternatively, you can try keeping the rooster upright instead, & holding him close against your body while you work on his spurs, but the rooster will struggle much more. Use a hand towel to pick up the potato and spear one of his spurs almost completely into the potato; or slice into the potato & press the halves around the rooster's spur. 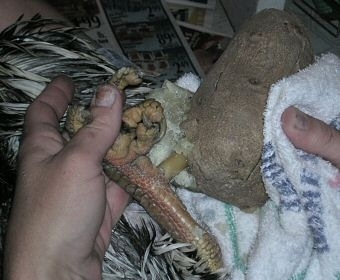 Wrap a washcloth or corner of a towel around his leg next to the potato to protect his leg from feeling too much heat. After 1 minute, pull the potato off the spur. Spur being inserted into a very warm cooked potato. Use a regular pair of pliers to gently grip the base of the spur. Gently twist the spur in back and forth (clockwise and counter-clockwise) movements. (Be careful to not bend the spur at an angle too much, because that would damage the base of the "quick" and hurt the rooster.) The hard outer sheath of the spur will twist loose after 2 to 6 twists. Carefully lift the sheath straight off the sensitive inner "quick." Spur sheath being lifted off inner "quick" of spur after gently being twisted loose. If needed, microwave the potato a short time to reheat it, or cook a new potato. Cool it slightly, then repeat Steps 5-6 to remove the other spur sheath. Put the rooster in his recovery area. A shortened spur is more vulnerable. Over the next several weeks, if you have to pick up or handle the rooster, take extra care. If you push hard against a spur, or he hits one hard while struggling, the rooster will feel pain and possibly bleed out the tip of the spur. If the spur bleeds quite a bit, pat white flour, sugar or blood-stop powder on the tip. Then you will probably need to hold the rooster and gently pinch the end of the spur a few minutes to stop bleeding. Then apply more flour, sugar or powder. Antiseptics are not usually needed. The spur will heal within a few days. After removing their outer shells, spurs will gradually grow long again. After several months, they will reach their original length. If you remove spurs' sheaths regularly, they will develop a shorter normal length.